The map takes up most of the wall. Under it, the desk of the man who used to stick little pins into it, showing where a customer was expecting a delivery. When you are in the room, you can see the pinholes; most of the factory’s customers were in the Northwestern sector of the Département, from which I draw an unproven assumption the factory owner probably came from that area in the Tarn, initially. The factory produced pickles. This being France, the pickles were probably cornichons, baby gherkin cucumbers, salted then bottled in vinegar. Neither the brine nor the vinegar are sweetened, as they are in North America. Cornichons are usually eaten here with paté or other fatty meats. The pickle factory is now someone’s home and studio. We worked on an animated film project in this room yesterday. 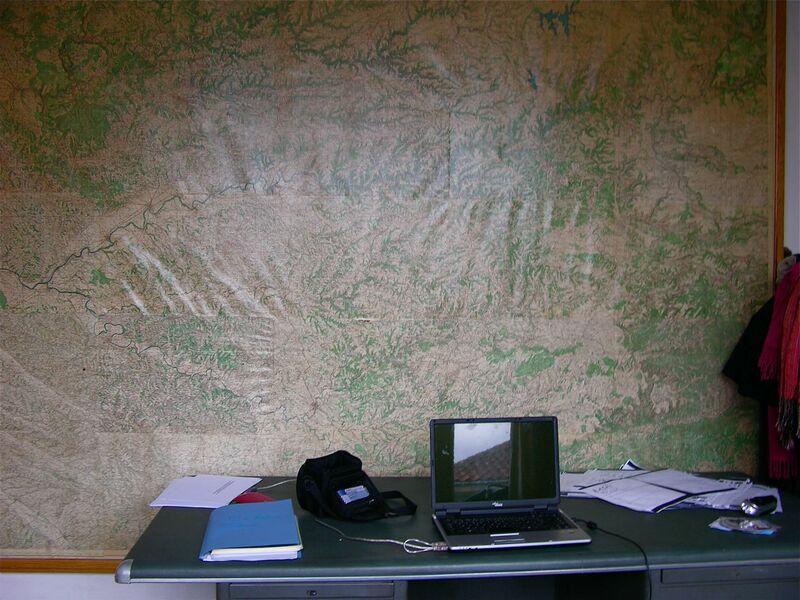 I was much taken by the map and the desk, and snapped many photos of both. As soon as I saw them, I knew they would eventually find their way into a story. First, they have to go through that silent process, somewhere in the brain, where the raw stuff gets filtered down and remixed with other memories. That filtering and remixing being part of the differences between a reporter’s level of wordsmithing, and that of a fiction writer, when faced by such a delightful artefact as the one pictured above. From real-life interest (if the map doesn’t hold your interest, it won’t make much of an impression on you in the first place); to telling a real or imagined someone about it (what I’m doing here); to wondering ‘and what if the map were in such-and-such a character’s office? and what if the deliveries were delayed that day because of…’ and so on. Because of another local project involving the tannery workers’ strike of 1909-1910, I’m reading quite a bit of local history, written by people recalling events from their childhood or that of their relatives. Some of it is first-hand accounting of the finest sort; some is a lot more ackward. Even some of the less-successful accounts are truly poignant because of the things they imply about the way people lived; the things they valued most; the dreams they did not pursue; the need to leave some tangible record of what it all meant. Some of those writings are the literary equivalent of folk art, their very ackwardness being a part of their appeal. Meanwhile, in the work in progress, I’m going through all the scenes involving one specific character. All of them need revision; plus I know there’s one scene missing which is still in draft form in longhand; it hasn’t quite gotten to the place where the opening words pop up at me with that urgency of the character saying: This is what I feel. This is what I need to express. It’s always about finding a balance between the spoken and the unspoken. To say or not to say. To say how and to whom. For most people, those are the questions. For example: what was the owner of the pickle factory thinking about while he stuck those pins into the map? Was he Napoleon preparing Austerlitz? The retreat from Moscow? Waterloo? Was he planning his daughter’s wedding, or his own? Looking forward to a joyful reunion, or an ongoing argument?